This small floral wonder from Ecuador portrays a rugged but enticing look that will readily fill a flower pot in consort with other flowers and deliver a crescendo of colors that simply mesmerizes. The word Limonium is a Greek term which means ‘misty blue’ and hence these two always follow the first name. They are petite and nifty looking and their bluish color blends well with yellow flowers as well as the heavier hues of red, crimson and orange. 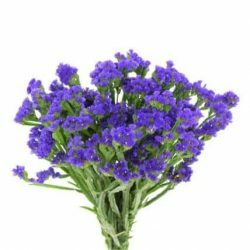 Bunches of Limonium Misty Blue are perfect filler flowers in combination with other flowers and are especially ideal for decorating your special event. 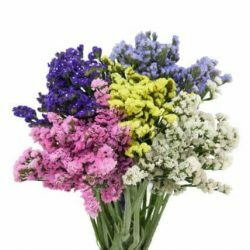 Buy Limonium flowers online at wholesale prices for wedding or special event decorations.